I have a M&P .40 and the mag is an extremely tight fit. With the adjustment screw removed it is still tight. Cuffs won't seat at all the pouch is too thin. Perfect low profile fit. Very comfortable and light. I forget that I have it on. Excellent piece of equipment, works and feels the way I expected. Great for plain clothes assignments. Tight fit on the cuffs made them difficult to remove initially but its all good now. The definitely won't fall out. Standard S&W Model 100 chain handcuffs will not fit into this. I should not have to use a heat gun to reform the cuff case section to fit handcuffs. It is so tight, I needed to use two hands to try to jam the cuffs in and there is no way to pull them out without using two hands and pulling the entire case off of my side. It's too bad because it is comfortable and the mag pouch works very nicely. I unfortunately have to return this item. What a disappointment. Will this holster hold the mags of the CZ P01 9mm weaon? The '9mm Double Stack' fit should fit the P01 magazines. 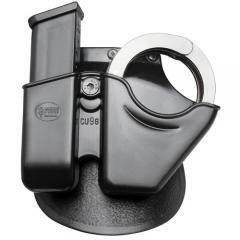 Does the cuff case fit hinged handcuffs? Case fits standard chain handcuffs only. We recommend the 'Gould & Goodrich Gold Line Belt Slide Cuff-Mag Case Model 841'. Don't like paddle back. Do you have same item in a belt carry version? For Glock and H&K 9mm, .357, .40 Cal.